Globalization pervades every aspect of our life. This is particularly true with vascular intervention – both coronary and peripheral. 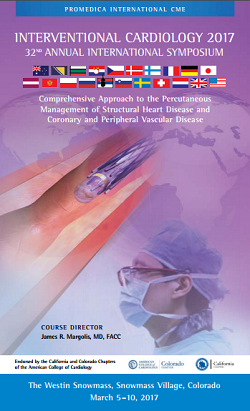 Although it has always been the purpose of this symposium to present that which is new and different in coronary and endovascular intervention, it has been equally important to place the avant garde in perspective. This 32nd annual symposium is focused on creating such a perspective. our international format with faculty from five continents gives us a worldwide perspective illustrating the cutting edge work performed both in and outside the US. equally important is the perspective of how differing socioeconomic factors alter the performance of PCI in different cultures and different countries – usually achieving comparable results. It is our goal and mission to make the next thirty years as interesting and innovative as the last thirty-one have been. As always, my charge to the scientific committee will be to bring faculty who will present on topics apropos to that which is happening in each country. We will continue our focus on international perspectives, a concept initiated by Andreas Gruentzig and as important today as it was in 1977.